I’m housebound again. The asthma has kicked in and I was only outside a little bit yesterday. When I breathe and wheeze the dogs can’t figure out what it is! Thank goodness I can get into a doctor on October 1. I took some kind of generic allergy medication I had in the cupboard a bit ago and I’m breathing better. I just hate not being able to go outside when it’s so nice out there now. Someone asked me to show some more kitchen pics. Here are the shelves with my new dishes. And if you’re wondering, yes, my kitchen shelves are always this neat, because I’m a neat freak about it. Now not everything out of place bothers me so much. I’ve always been a stickler about kitchen stuff. No matter what I do I can’t get good photos of the bottom cabinets. There’s just not enough room to back up. Here’s a question I don’t know if I want the answer to. 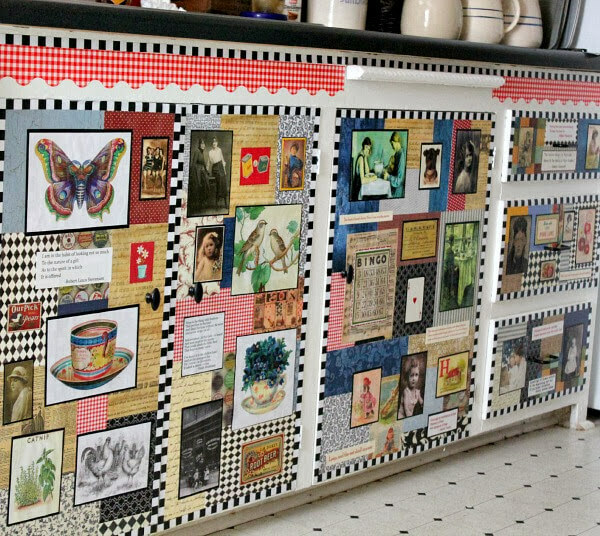 Would you be able to live with a kitchen that looked like a collage? A very colorful collage? I have another question for those of you with asthma. Do you stay inside in the spring and fall? Because I don’t even know what it is outside that aggravates it so. Last time I brought it on tearing out the vicious murderous vines. Remember that one? I’m kind of wanting to decoupage the back of my brown living room stand alone shelves with an old torn up book of Bartlett’s Quotations. I’ve pondered doing this for a long time. But I wonder if paint and glue aggravate allergies. I think I shall wait until it’s a bit cooler before I decide. Ever Get Your Hair Cut Really Short? Brenda, my son is a very bad asthmatic and is just now doing better. We ended up seeing an asthma specialist from a big University and he made great strides with my son. His kicked in if the wind blew wrong and the ER knew us by first name. Fall was the hardest for him due to ragweed and mold count and such. He ended up needing to go on Singulair 1x a day for the time being and he is also on Symbicort in haler. We have a nebulizer here along with an epi pen when needed. It is a battle for us with him. As for the cleaning products yes we had to go natural. Meaning vinegar and water or plain water. It has helped alot. I make all my cleaning products now. Brenda I love all your checks and I just spotted that wonderful red picnic basket, oh gosh, how fun!!! hope you get this asthma under control. I don't want you to miss Fall! Throw away that PIne Sol. Go natural. You can buy a brand that is all natural without fumes. My husband has asthma. I know that candles bother him as well. I get it occasionally. I know that Pine Sol really bothers my breathing. Clorox as well. I've heard from a doctor that when you are having an attack to drink a cold Coke. Just be careful with that wheezing. Also paint can be an irritant. You can buy the kind that has no fumes. Good luck and I hope it gets better soon. LOVE LOVE LOVE your checked rolling pin! Sorry to hear you are not too good with asthma – but GASP your Dr's appointment is very long away for asthma. I'm a chronic asthmatic very allergic to SMELLS even flowers so hardly ever pick them for the house. paint tips me over as does cleaners. So we tend to use very organic stuff around here and diet is also a trigger for me so a very back to basics diet too. I think your kitchen is so charming! Glad you are feeling some better. Anxious for you to get to the Doctor – maybe they will refer you to an allery/asthma doctor and real soon. Bless your heart… asthma is not fun – especially in the fall! I don't have asthma, but my little one has suffered with it. The best remedy for her is a nebulizer treatment (I've used it for my congestion, too, and it is fabulous) and then a warm bath with lots of steam, followed by a coating of Vicks Vapor Rub (rub some on the bottom of your feet & cover with socks – old remedy)…. The steam tends to break up the chest pressure a bit… Hope you can get something when you go to the doc. Being cooped up inside is no fun! The rolling pin is adorable… I'm in love with your new look. It's so you! Brenda, You know I adore your kitchen! It's unique and so artful, playful and happy. You can always change it if you get tired of it. Judy sure is a great friend! Glad you both have each other. Love the rolling pin. 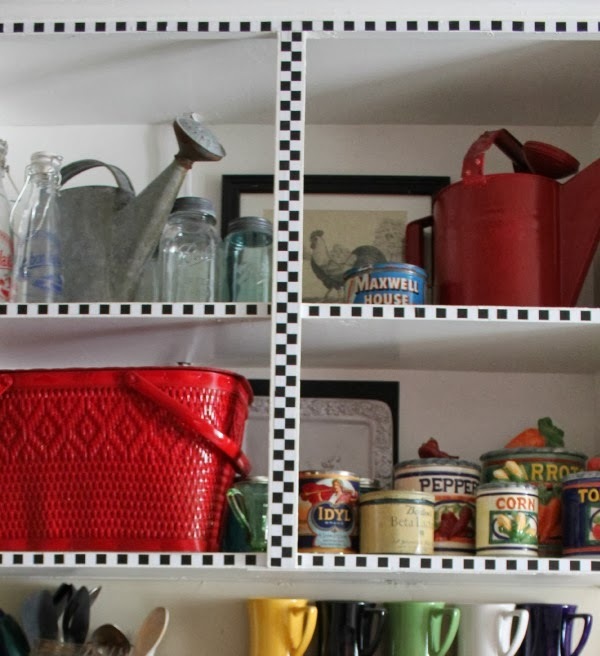 Just noticed the checkered print on the edge of your upper cabinets and really like it. Your coffee bar is really nice. Your kitchen is so happy and cheerful. Hope you get your asthma under control. I have bad allergies and have been miserable the past few days. Glad you have an appt. because asthma is nothing to play around with. The ragweed here in Georgia is awful this year, and both my husband and I fell terrible. Sniffles, runny eyes, the whole shebang! Hope you feel better soon. Love your kitchen! Cute rolling pin too! I just love your kitchen exactly the way it is. Sometimes I see kitchens in pictures that have nothing on the counters and I think, wow, I'm a mess here. I try to store things away but I guess I just like to have a kitchen with personality. I have written about my asthma many times on my blog. For me it's hereditary from my father…2 sisters have it and both my daughters and hubby. Many people have allergy induced asthma, and I think that would apply to inhaling any foreign substance. The pollen, ragweed, mold…try to go out after 1 p.m. when allergens have dissipated a bit and keep the windows closed until then, too. I've never had a problem with the cleaners I use, just make sure you have ventilation. I get my asthma going from colds and allergies. I've never had a cold without going into bronchitis and then asthma. Well enough of that. I take Singular for allergies and asthma, a maintenance inhaler twice a day, and another inhaler for sudden attacks. If I get really sick with it I have to go on Prednisone for a few days. There is no cure for asthma, you have to avoid the triggers and follow your doctor's plan. I wish you all the best, it's not fun at all. I have seen the ER one too many times! So sorry to hear that your asthma is acting up. I don't suffer from that, although I do have allergies from time to time. My allergies often lead to upper respitory problems too. Maybe you need an inhaler for flare-ups. You might also need to take Zyrtec or Claritin to keep your triggers at bay. Loved the cute rolling pin that Judy gave you! It's PERFECT in your kitchen. That rolling pin was made perfectly for you…and your blog. Cute post. 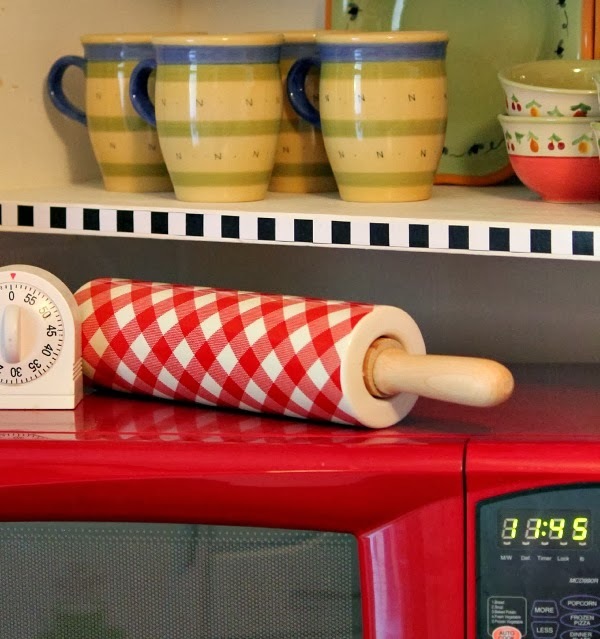 Your red checkered rolling pin is adorable. 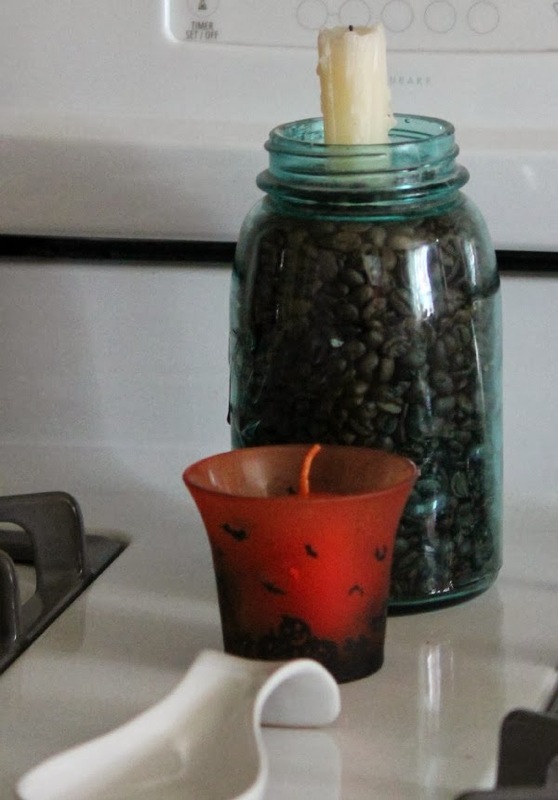 Your kitchen looks cute and cozy. 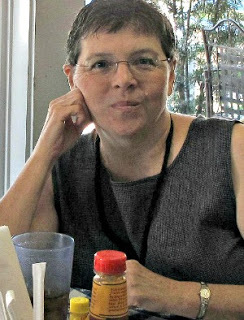 I am always amazed at the things that show up in photographs that I never noticed at the time I was taking them, but I would not have noticed the paper towel in your pic if you had not mentioned it. Please be careful with your asthma, if it is already being triggered by ragweed or some other pollen, adding another irritant like latex paint fumes or certain cleaning products could suddenly land you in big trouble. I would leave the painting (paint fumes) and dampness from drying paint for another time when your asthma isn't so twitchy. Better safe than sorry in the ER. I've had asthma since I was a child. The various inhalers that are available by prescription now are a Godsend, but can be very expensive. Sometimes the allergist or doctor has a sample for their patients if you ask about it at your office visit. Vicks Vaporub helps me for cold and cough congestion, but if I use it on myself, it causes my little Fuzzy Pom to cough terribly and have trouble catching his breath if he is even in the same room with me. Sorry you are suffering from asthma. That is scary! Hope you can find relief soon, Brenda. That rolling pin is so cute – must try to find one, but then I would make pies and rolled cookies and I don't need to eat them. I too suffer from asthma, but I keep it at bay with Advair and Singulair. I am so sorry your Asthma is at a worse period right now. It is definitely a frightening thing. I have had Asthma since I was a little girl (I am now 60). I actually 'outgrew' it for a while – for about 17 years I never had an attack. When I was pregnant with my 4th child, it emerged again with a vengeance. My brother and Father had it also. Only 1 of my 4 children inherited it – my youngest – now 22 – years of steroids, inhalers, nebulizer, trips to the ER (always in the middle of the night), an allergist put him on medication that changed his life (Advair, + allergy shots). His Asthma was allergy, seasonally induced and he is allergic to cats. Now, he is in a period where he has no problems with it – though he still uses allergy meds and keeps an inhaler handy at all times. We keep our nebulizer prescription updated and have 2 nebulizers. I still have seasonal allergy induced asthma, but strong odors, cigarette smoke, cold weather, stuffy hot, dirt, cat dander 'and many 'weeds' trigger it as well. I am never without my inhaler. Never. I have 2 little granddaughter who have Allergy induced Asthma also. They are on maintenance meds also. I do not let asthma keep me from my yard work – I use a mask when Fall rolls around – that is when I have the most problems. There is are 2 weeds that arise at times that give me fits – Crabgrass and Johnson Grass. I feel for you. I know how absolutely debilitating and miserable it can be! I am sad you have to wait until Oct. 1 to get in with the Specialist – that is pretty par for most of them though. I hope he/she can get you on some great maintenance meds that work for you! If you get a really bad attack ever again…don't wait…get to the ER…or call an Ambulance!! 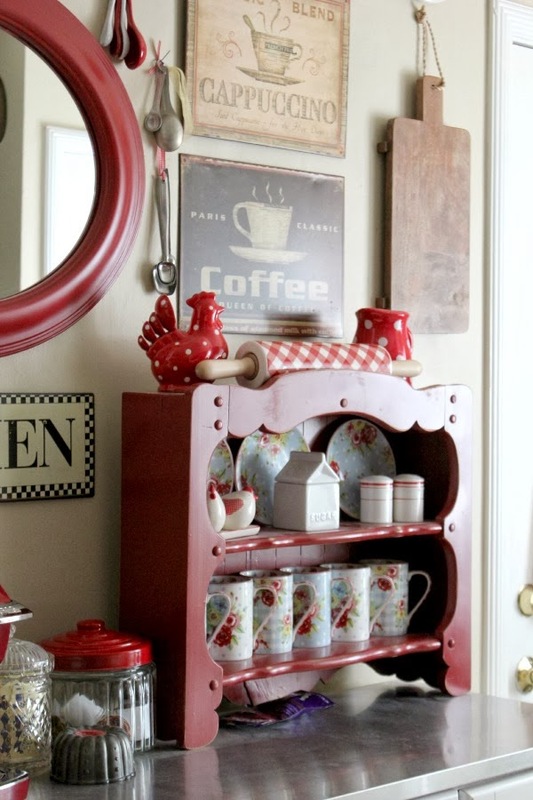 I will never EVER grow tired of your whimsically charming kitchen! It is the first kitchen that caught my eye and melted my heart! From colourful crockery in playful primaries of polka dots, florals and checks to your new French inspired collection, AND that need for neatness, (I can relate! ), it's a space that brings a storybook smile to my face!! Brenda, please take care of yourself. Should you really be flirting with paint right now?!! There are some good suggestions from all your friends here to get you by until October 1st. So until then, move AWAY from the paint brush and pick up that darling new rolling pin and bake up some sweetness for your senses – taste and smell… and sight for us! I only know that the news reported this year ragweed is one of the worst in recent history. That's in Richmond, but it may be the same there where you are. Anyway hope you feel better soon. I love seeing pictures of your little kitchen. we can pretty much see it from every angle you've photographed. I like it! Also…the photo with the paper towel and the napkin? and the pen and paper (I'm assuming a shopping list or something) …and the soapy dish water? I'm glad you didn't retake it. I love your kitchen, Brenda. It is so colorful and I love color! My little granddaughter has to use an inhaler for her asthma. Lots of things will set it off, even just changes in the humidity. I hope you find out what causes yours and a good med to control it. Love the new look Brenda!! Use rubbing alcohol and water in a spray bottle for all your cleaning. It leaves no residue and we seem to tolerate it better. I use it even on my floors. About the asthma..ragweed in September is really bad! Paints, harsh chemicals and smells will trigger it for some. Singulair and an inhaler works for our sons. I love your cheerful kitchen and if you DO get tired of the cabinets like this, you can strip it off and repaint. It's going to be happy and warm thru winter when it's cold outside. I think it's adorable. Good morning, Brenda…sorry to hear your asthma has flared. I agree that part of it may be paint/cleaners fume induced, so it might be a good thing to change cleaners. I use a "homemade" cleaner that works well and leaves everything shining. Sorry you have to wait so long to get into the doctor. Love the new blog look! 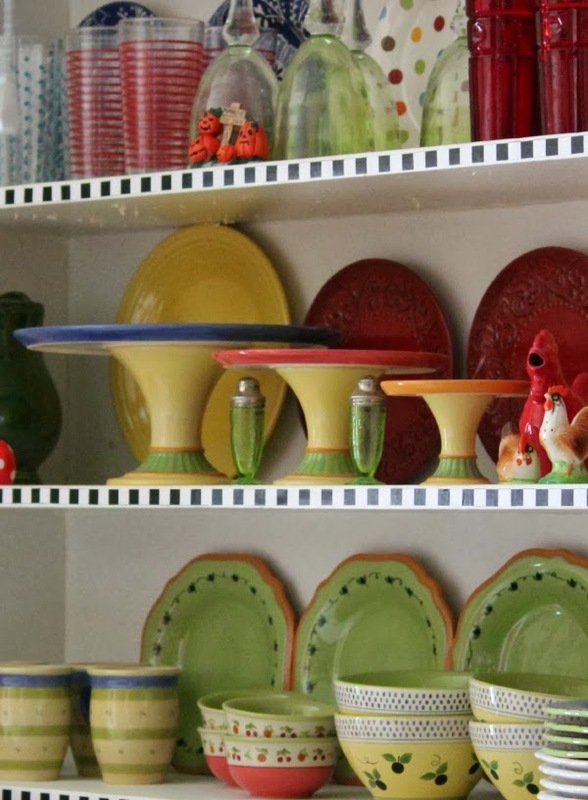 It, like your kitchen, is inviting, cheerful and colorful! TX allergens have been very high this year. Worse than usual. We won't get to open any windows around here, even when it does get cooler. My pets and I are both suffering. Luckily my elderly mom isn't bothered by the allergens much. Your new dishes look nice in your kitchen. Could that rolling pin be any cuter??! And to answer your question, yes, I think I could easily live in your kitchen. Tell your daughter you've still got a lot of years left in you, and knowing you you'll change that up a few times before you've finished your job here on earth. Pine Sol is not a good idea. Go natural. You can make your own on the cheap. Brenda, Love! Love! Love! your kitchen, where did Judy find the adorable rolling pin, have athlete asthma, at times even walking up steps or steep drive would bother me, use to take meds and inhaler but seems like after taking a year of IV's and supplements for Fibro and Chronic Fat. so many symptom's, depression asthma, restless leg, IBS, panic disorder, brain fog have left me, I think everybody suffers from lack of certain vitamins and supplements we need , but it is so very expensive to have the tests to find out what your body is lacking. Hope you will feel better soon! 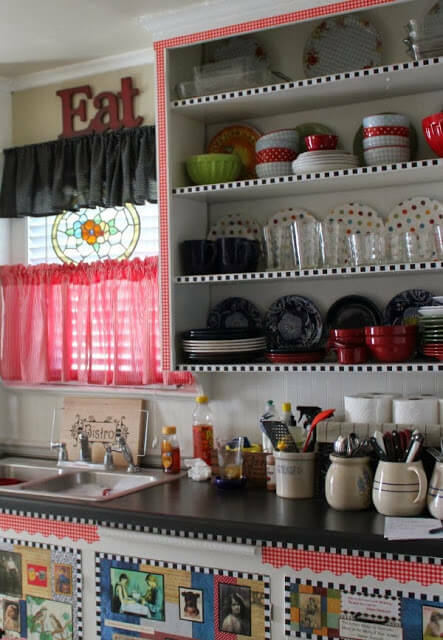 I love your kitchen, it's adorable! Love the checked rolling pin too. I have asthma. I used to use my inhaler four times a day but I was still having break through asthma and coughing up a storm. I have cough variant asthma so I cough, I don't wheeze. But I used to cough so much that I would throw up and it's hard to catch your breath when you're having a coughing fit. Then my doctor put me on daily doses of Flovent and also on Singulair and Claritin daily as well. I then only needed to use my inhaler every other day. When my doctor started giving me allergy shots I was able to practically stop using my inhaler. I now only need my rescue inhaler a couple of times a year if I get a cold or something seriously aggravates it. Strong smells such as some cleaning supplies, perfumes and cigarette smoke can send me into a coughing fit but I just walk away, and I don't need to use my inhaler. However, if I couldn't get out of the room I might have to use it if the smell was strong enough. I wear a "hospital" type mask over my nose whenever I clean my house as I am allergic to dust. The mask also helps with smells. I may look ridiculous but it's worth it, lol! I can now go outside in the spring without having any trouble with my allergies (thanks to my shots) or asthma (thanks to my meds). However, whenever I go outside in the winter time the harsh cold can make me cough so I have to breathe through my nose or cover up my face. I thought I'd mention that my mom has asthma to. She kept winding up in the hospital because she was wheezing so badly and having shortness of breath. Her doctor put her on Singulair and it has helped SO MUCH. It helps keep her out of the hospital. She also has a nebulizer that she can take during the day if she needs it, but that Singulair has made all the difference in the world for her. It takes about a month to fill the affects of it but it's helped us both! Singular in the Spring. Benadryl in the Fall. I always have my inhaler…which I only use when it is bad. I dont switch out nothing…I love the smell of Pinesol. I have had asthma since I was a young child. Years of allergy shots helped to the point that the main thing that makes mine flair up are chemical smells, ragweed and mold. I have switched to using Vinegar for my main cleaning agent. It does wonders and also disenfects too. Paint smells have always bothered me too. Hope you are able to figure out what triggers it. Brenda, love your full-of-life kitchen! The rolling pin is the best! Hope you find some relief for your asthma soon. Love that rolling pin! Your kitchen reminds me of Mary Engelbreit. Love it ~ so cheerful. Hope the asthma improves after the doctor visit. Love your kitchen and photos. Pet dander and dust cause problems for me and asthma. . I have the coughing type. Finally found that Shi Tzu puppies do not cause problems for me. Vinegar is a great cleaner. Take care.